First of all, can we all give a huge “HOORAY! !” to the Patriots for making it to the next round of playoffs? OK, many of you may not want to, but I’m pretty thrilled they made it and am crossing my fingers they get all the way to the Super Bowl again. Though this year, I hope they win it in a far less stressful way, if you know what I mean! You don’t need tickets to the game. You don’t need to drive all the way to the game. You can cook and bake as much as you want and don’t have to worry about transporting the food to the tailgate. You will be warm! Let me tell you, New England weather is no joke and Patriots games at this time of year are not for me. Instead of tailgating in the parking lot, I’d be huddled in my car until the very last second before the game begins. Lots of my friends have kids and it’s tough to get everyone together without including the kids. You most likely can’t bring all your kids to the game, but you can bring them to a Homegate. The NFL has so much fun Homegating gear that makes staying home super fun and lets you add a whole lot of team spirit to your celebrating! 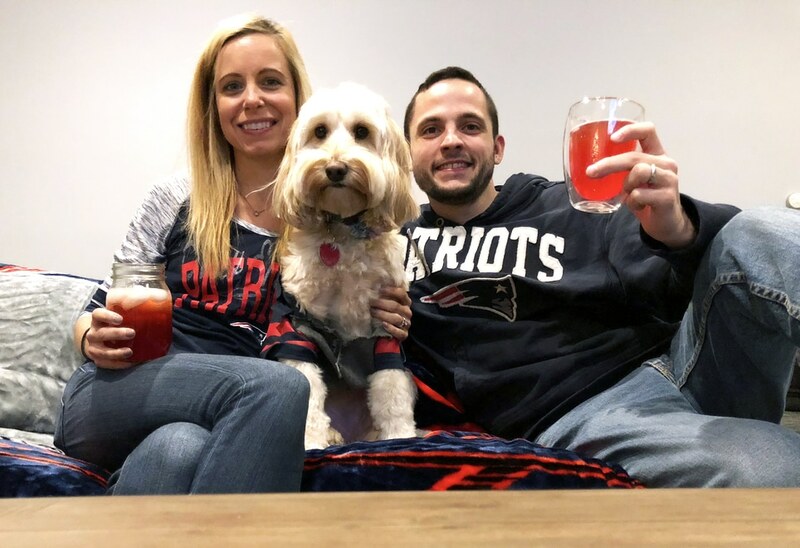 A few weeks ago, I invited some friends over for an NFL Homegate to watch one of the last Patriots games of the regular season. I put on my Patriots shirt and spent the day cooking and baking. 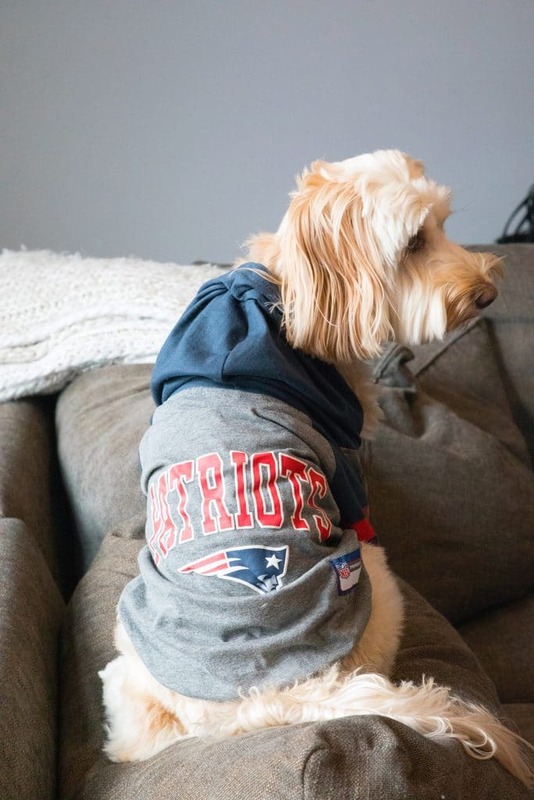 Of course, Winnie wore her Patriots jersey, too. We are pretty sure that the Patriots only win when she’s wearing this shirt. She’s obviously a lucky charm. Before my friends arrived, I set out all the food right by the comfy family room couch where our television is. 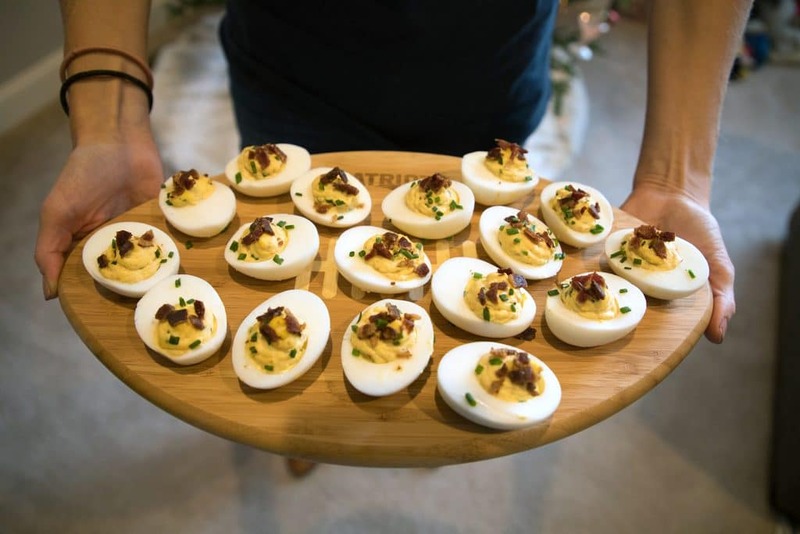 I’m so happy deviled eggs are back in style. 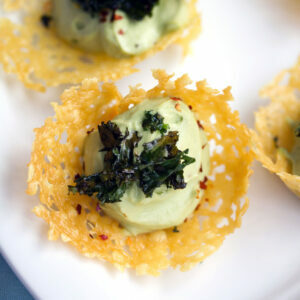 They’re one of those appetizers that are easy to make for a crowd and almost everyone loves them. 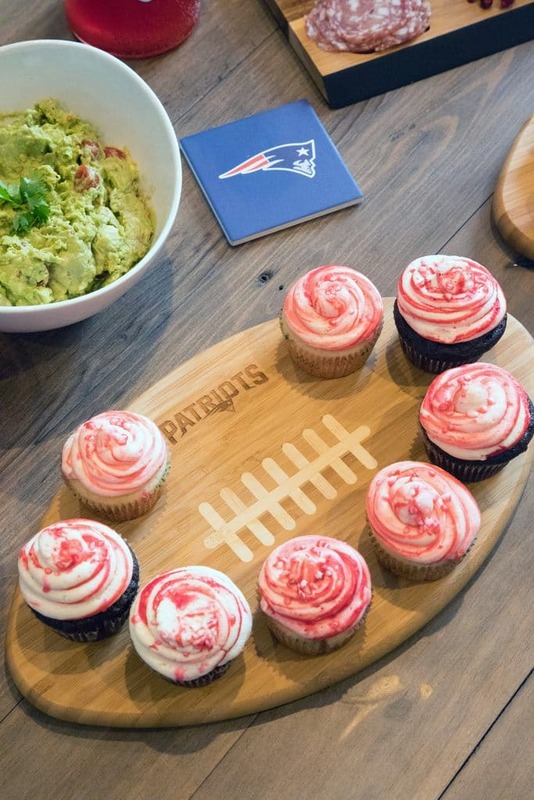 They’re best served on a football shaped cutting board, right? 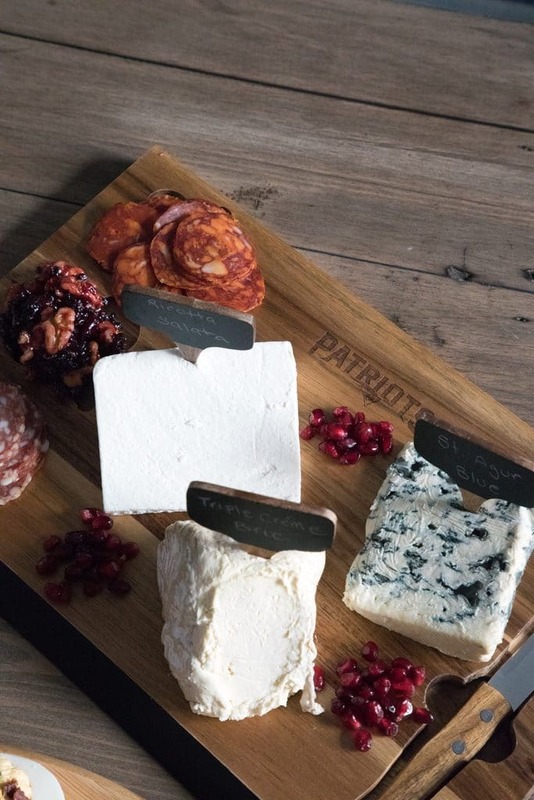 It’s not a party without a cheese plate (seriously, I honestly can’t remember the last party I threw that didn’t involve some sort of cheese plate) and the NFL Homegating cheese board makes putting together a pro cheese plate so easy. I also mixed up a sangria made with Straw-Ber-Rita. 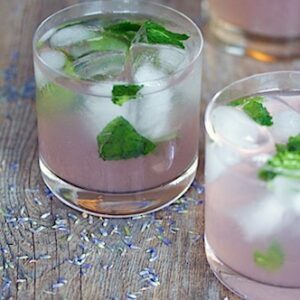 They’re such a fun alternative to the typical beer or wine. 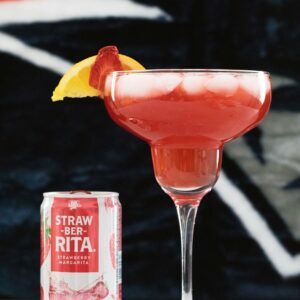 I mixed the Straw-Ber-Rita with cranberry juice and soda water and added fruit in for a Strawberry Margarita Sangria – everyone loved it! 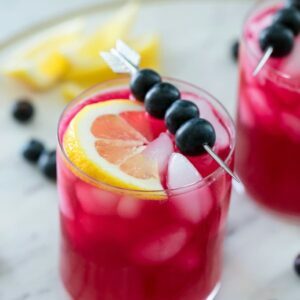 Check out the recipe below if you want to try it out for your own Homegate and be sure to follow Lime-A-Rita on Instagram for more fun drink recipes. 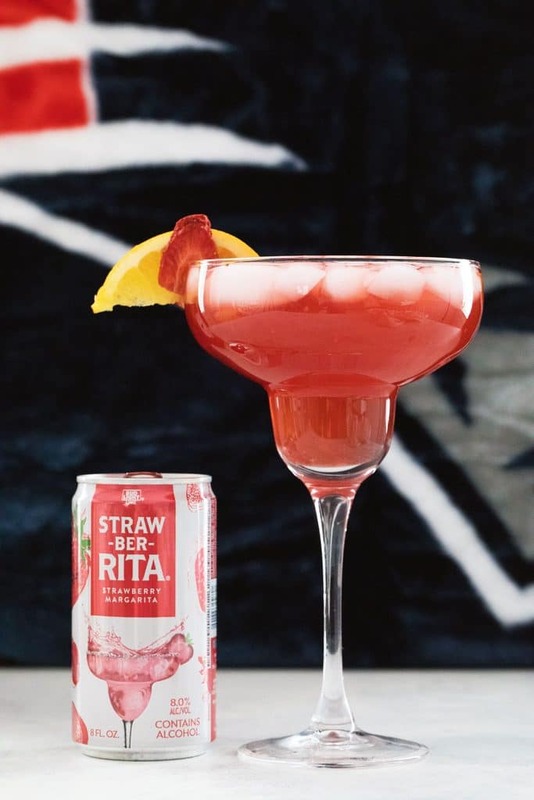 Straw-Ber-Rita combines with cranberry juice, soda water, and fresh fruit to make a unique and delicious red sangria. Mix together all ingredients in a pitcher or carafe. 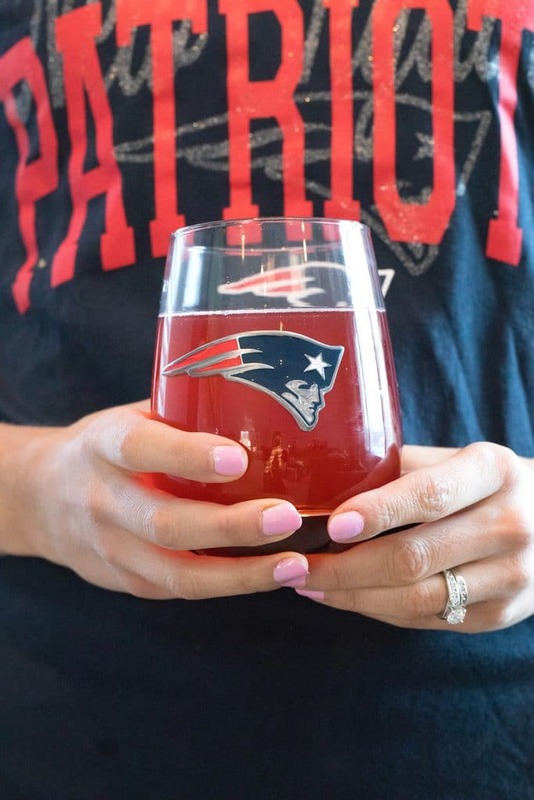 The cocktails are best served in a glass showcasing your favorite team! Another perk of Homegating? 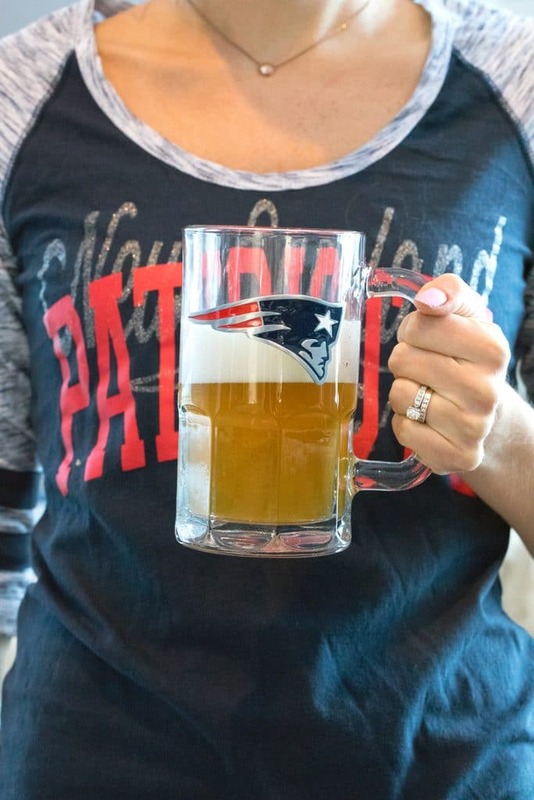 You wouldn’t be able to bring this fun glassware to an actual tailgate. And you’d be drinking beer out of plastic cups instead of these fabulous mugs. 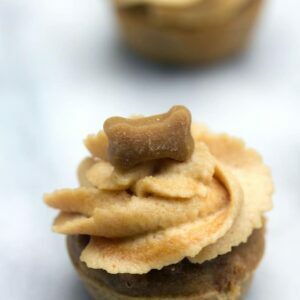 Plus, cupcakes. 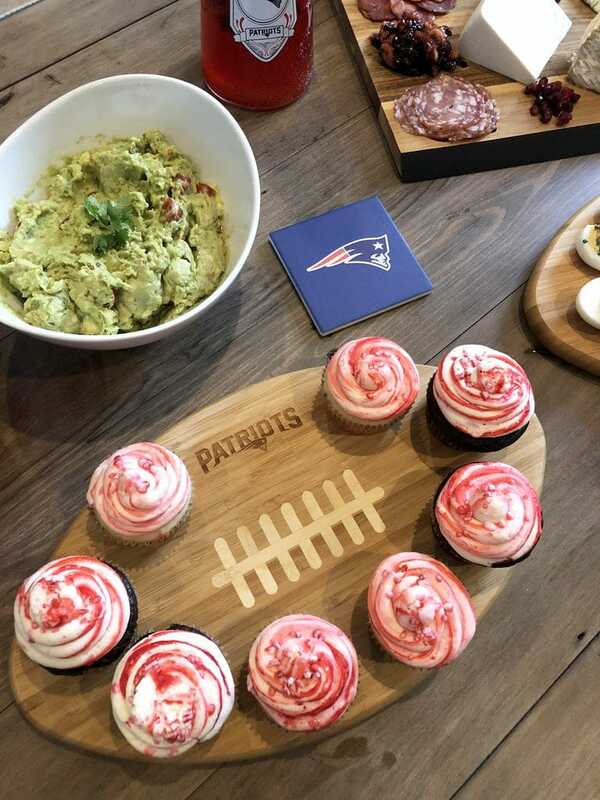 Of course, you could bring your own team themed cupcakes to a tailgate, but I speak from experience when I say eating a cupcake with mittens on is not fun. Little hands in the chip bowl! Like I mentioned, Homegates can be a lot more family friendly than regular tailgating and it’s fun to get everyone together without worrying about babysitters. It was also fun to see our friends’ kids since they’re often in bed or with sitters when we get together. We had such a blast catching up with everyone, eating and drinking, and oh yeah, watching the game! When everyone left, Chris and I settled down on the couch to watch the rest of the game (it was a 4:00 Sunday game, so our guests left before the end). Another win for the Patriots!! And yes, it was another super close game where it looked like they didn’t have a chance. Not having to drive home when the game ended? Priceless! And also yes, I continued eating long after everyone had left. With the NFL playoffs in full swing (and the weather beyond frigid), throwing a Homegate is the perfect way to enjoy your favorite football team’s games! 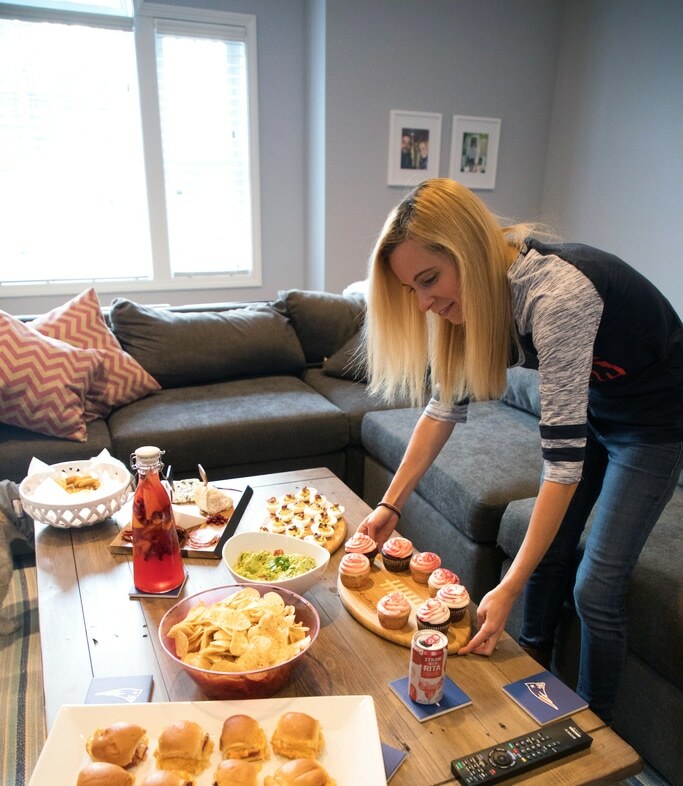 Enjoy gathering with friends and family in the comfort of your own (warm) home, but first, gear up with all of your team’s decor, apparel, and accessories at NFLShop.com/Homegating. 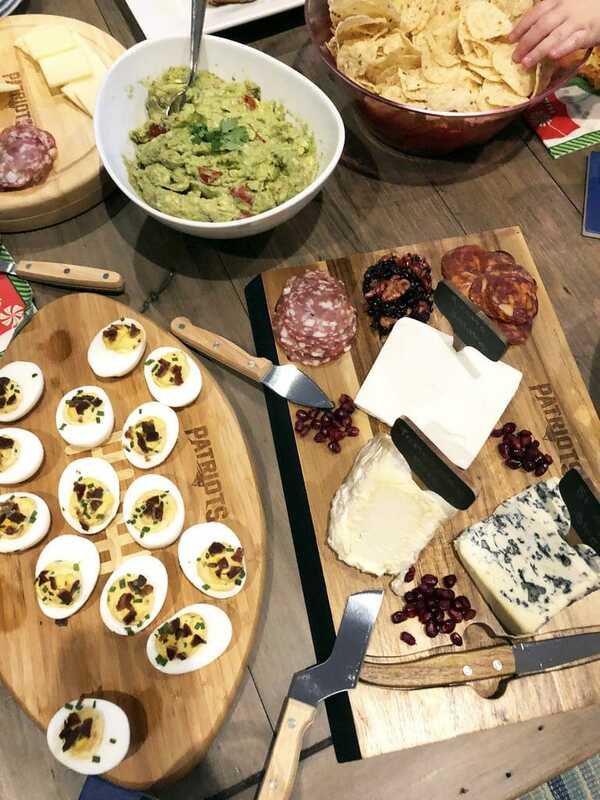 What would you cook and bake for your Homegating party? 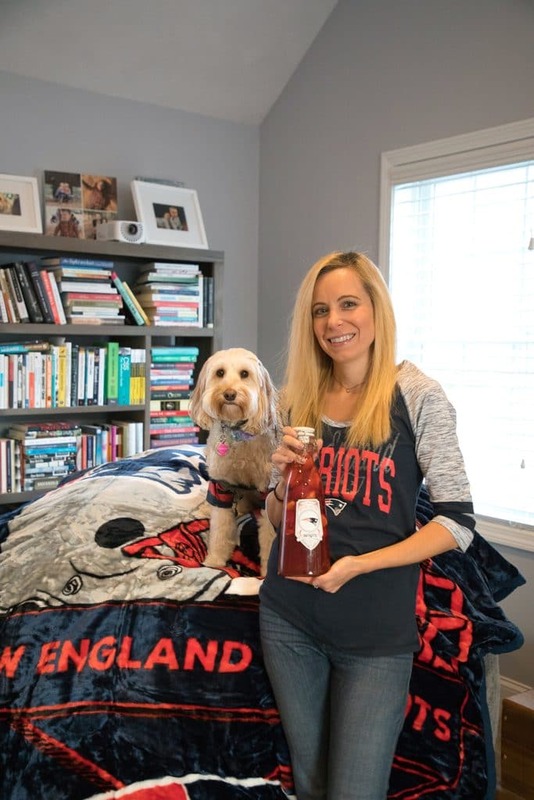 6 Responses to "How to Throw a Winning NFL Homegate Party"
Your dog is adorable! My team is no longer in it but I still enjoy the game and being with friends and family. Yes!!! 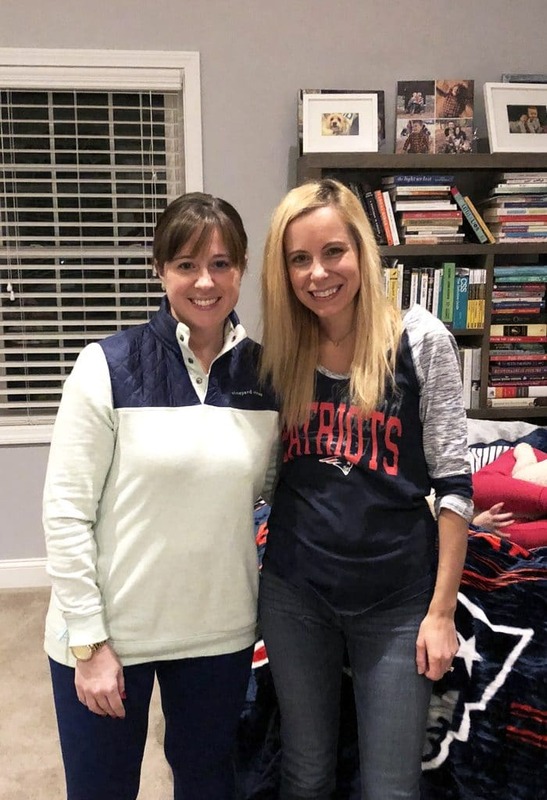 LOVE that you’re a Pats fan too! Absolutely love living in New England and cheering them on! 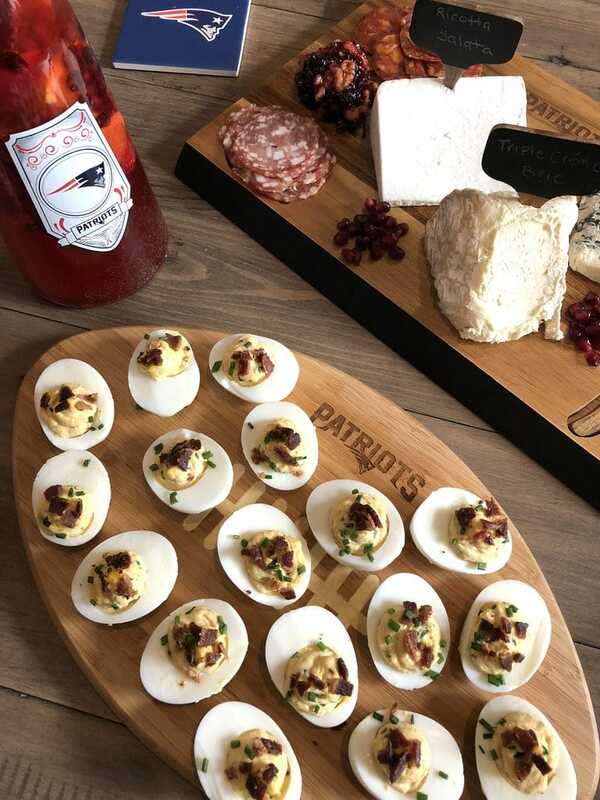 🙂 Those deviled eggs and cheese board look amazing!! Whoah, I want one (or maybe 10…) of those Strawberry Margarita Sangria drinks! Loving the Patriots theme all around! I would love to have a host like you for the Super Bowl. 😀 Loving the table! I’m from Pa, so cheering on the Eagles! This full of great advice!